There could’ve been a lot of other things said today in a post. Another post could’ve taken this one’s place. But I think turning thirty is quite a feat. Especially back in my misguided youth, I’ve thought I wouldn’t live to see twenty-five and had a feeling of utter hopelessness and depression I barely told anyone outside of immediate friends. But things have changed in the five years since that self-appointed expiry date. I now work for the US Federal Government, and as of this writing, I’ve been slated for a promotional interview, so good luck to passing that. I’m about ten days away from my now bi-annual overseas trip, this time I shall be spending one week in Japan before dropping down for two weeks in the Philippines. I bought a new car, I’ve made new friends, lost old ones, and discovered more about myself since then. I’ve covered a bunch of anime from Girls und Panzer which is a great staple, to Madan no Ou to Vanadis, which I want a new season of, to GATE which just ticks all the right-wing fantasies. I became more politically active yet restrained under the previous administration, apprehensive but begrudgingly approving of the current one, dismayed at the tone and direction of political discourse in the United States, and praying that the fourth box of Liberty is never used, the first three sufficient to keep us going on for a next two hundred years. I gained some followers and I am greatly appreciative of those who I have and still drop a like whenever I post, it means a lot to me that some people are still looking in at some dude’s part-time blog. Reisen on a Computer, drawn by itsutsuki on pixiv. So for now, I guess I’ll leave with this picture of my yearly tradition. 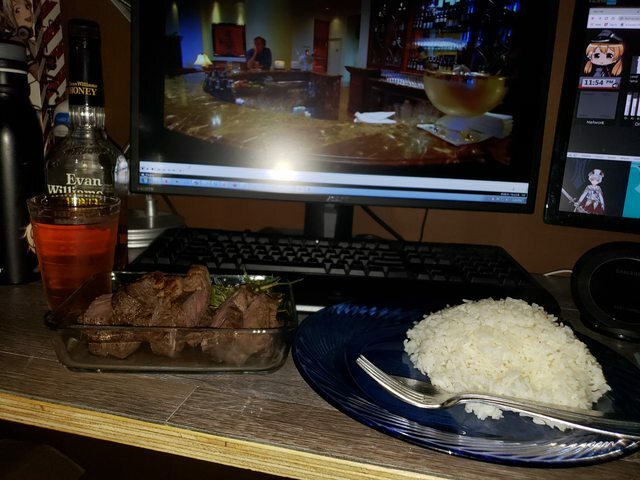 I spruced it up a bit, a pair of NY Strip Steaks enjoyed with rice and downed with a bit of iced tea fortified by Evan Williams Honey Bourbon. Watching the Top Gear Vietnam Special from Series 12. Plans for later today is to head on to the range and spend some time punching paper at the local range and then heading over to my parent’s for a Birthday dinner. So while I might’ve linked to the song I know I will be playing throughout most of today, I think the next song, from my favorite Country singer best exemplifies my mood. Cheers y’alls. I’ll get back to aniblogging when I feel like it, consider this my notice of hiatus or at least intermittent activity. This entry was posted in Blogging Stuff, Life, Trials and Tribulations. Bookmark the permalink. Whatever the future entails, be prepared to both work hard for it and enjoy it as it happens.